IPTV Dictionary is a free tool to get technical definitions and lookup industry terms from more than 11,000 terms, acronyms, and definitions. Data multicasting is the process of transmitting media channels to a number of users through the use of multiple distributed channels. Multicasting typically involves the use of group addresses, which allow receivers to "tune" to the same stream of data as it is transmitted over the network. This is in contrast to a unicast transmission whereby multiple copies of the stream are individually addressed to an end user and are transmitted over the network. Multicasting provides much more efficient use of the network resources. However, the use of multicasting can complicate media control functions such as pause and fast-forward. Multicasting (one-to-many or many-to-many) can dramatically increase the efficiency of a network compared to unicasting (one-to-one) or broadcasting (one-to-all) transmission. Multicasting is critical for mass media streaming sources such as IP television and Internet radio. Without the use of multicasting, a 3 Mbps television streaming service would require data connections of 30 Gbps to provide service to 10,000 customers. Multicasting group membership defines how members find, join and disconnect from multicast sessions. Multicast transmission involves the use of special multicast addresses. It is possible to configure multicast systems to provide varying levels of quality of service for different multicast members. There are many types of protocols (commands and processes) that can be used to setup and manage multicast sessions. Some of the key protocols used for multicasting include IGMP, PIM-DM, PIM-SM, MOSPF, CBT and BGMP. The processes and capabilities that these protocols have determine the amount of latency (setup and transmission delay), scalability (ability to serve many users) and protocol overhead (percentage of network resources that are needed for the protocol commands and operation). Multicast sessions may use security processes to ensure administrators can configure multicast trees and only authorized members may attach and decode multicast media. There are other emerging forms of multicast transmission that include gridcasting and peercasting where multicast recipients retransmit media to other users. This diagram shows how a single source multicast data session to allow a single source to send the same information to multiple receivers without the need to repeat the transmission back through multiple switches and routers in the network. 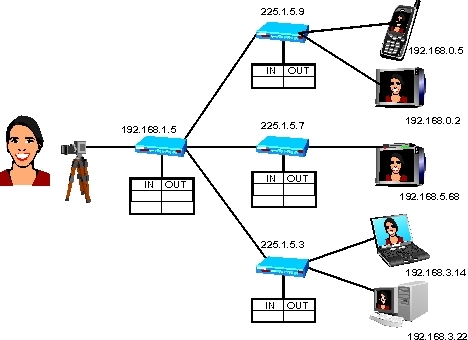 This example shows that an IP address source is combined with a single multicast address that allows each router in the multicast tree to forward the packets only to members of the group. In order to add this IPTV dictionary tool to your web site and give your visitors the way to lookup industry terms from more than 11,000 terms, acronyms, and definitions, just copy the HTML code below and put it into your web page where you want to provide access to your dictionary. Disclaimer: IPTV Dictionary Tool is the trademarks of Althos. Althos is not affiliated with any other website and provides the information in this dictionary from content created by our expert writers. Althos provides our services on "as is" and "as available" basis and we do not provide any guarantees regarding this service's accuracy and/or availability.